Alfred Tennyson was born on 6 August 1809 in Somersby, Lincolnshire. Although his early publications – Poems by Two Brothers(1827), Poems, Chiefly Lyrical (1830) & Poems (1832) – were critical & commercial failures, his later collections, Poems (1842) & The Princess (1847), were more successful. In 1850, the publication of In Memoriam A.H.H., a lamentation on the death of his close friend Arthur Hallam, established his literary reputation & increased his popularity, & he was appointed Poet Laureate. Tennyson (1809-1892) aged around 60. Photograph by Julia Margaret Cameron. From then until the time of his death in 1892, he was one of the most famous men in Britain & the nation’s favourite & most beloved poet. A love & knowledge of Tennyson’s poetry brought Britain together as a nation, & his renown & importance stretched across the British Empire & was strongly felt in the United States. His image – reproduced in paintings, engravings & photographs – made him one of the most recognisable figures of the day. Tennyson’s death in 1892 made the front page of national newspapers. 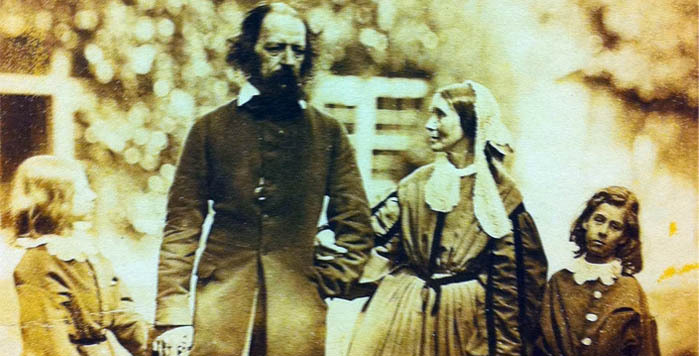 Tennyson married Emily Sellwood in 1850 & had two sons, Hallam & Lionel. However, in the years following his appointment as Poet Laureate, Tennyson increasingly grew to dislike his fame & the way his celebrity seemed to give others permission to violate his personal space. Tennyson felt bombarded by admirers & no longer able to protect himself & his family from the invasion of unannounced visitors at Chapel House, his Twickenham home. Tennyson felt bombarded by admirers & no longer able to protect himself & his family from the invasion of unannounced visitors at Chapel House, his Twickenham home. As a result, the poet decided, in 1853, that he & his family should leave London & relocate to Freshwater, a remote region of the Isle of Wight, believing that here they could enjoy a quiet life away from his admirers, seeing only their friends, at the times of their choosing. The family moved into Farringford House on 25 November 1853 & rented it until Tennyson had sufficient money, in 1856, to purchase it outright. Farringford House by the illustrator Edward Lear who often stayed with the Tennysons. For almost forty years, Tennyson, his wife, Emily, & their sons, Hallam & Lionel, entertained guests at Farringford. 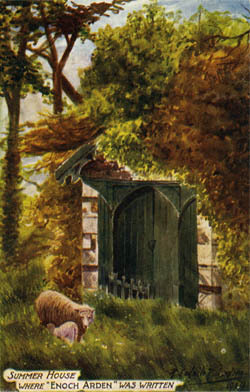 Tennyson’s status as Poet Laureate attracted some of the most admired figures of the nineteenth century to the Isle of Wight, including Henry Wadsworth Longfellow, Aubrey de Vere, John Everett Millais, Algernon Charles Swinburne, Ellen Terry, William Holman Hunt, Coventry Patmore, Tom Taylor, Charles Kingsley, the Duke & Duchess of Argyll, & Giuseppe Garibaldi. Front page of the Illustrated London News, 23rd April 1864. The Tennysons meeting Garibaldi at Farringford. The Isle of Wight was a very conducive place for Tennyson’s creativity & it was here that he wrote some of his most famous poems, including Maud (1855), Idylls of the King (1859 -1885) & Enoch Arden (1864). Tennyson often read the poems he was working on to his guests, believing that this helped his composition. Click here to read some of Tennyson’s poems. You may also like to listen to a Tennyson reading his poem, The Charge of the Light Brigade.